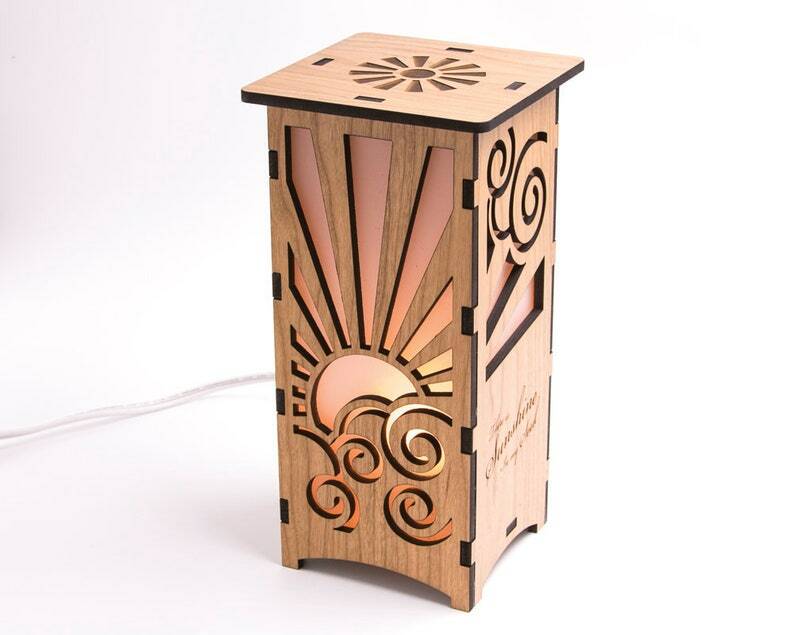 This wood sunburst lantern shows a wrap-around design of a sunburst rising from behind the clouds. Each side has a quote related to the sun; "You are my sunshine, my only sunshine, you make me happy, when skies are grey" on one side and "There's sunshine in my soul" on the other side. The top features an engraved sunburst design. *OPTIONAL laser engraved customization on the back! Write a nice note to your loved one, a "Happy Birthday" message, a date, or anything you can think of! MAXIMUM 250 CHARACTERS - this guarantee's that your message will fit and be big enough to be clearly read. Please select the font you would like under the "Customization" drop down menu and write your details out in the "note to seller" box at checkout! 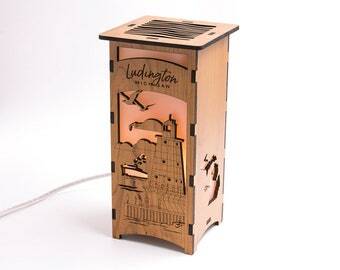 I will arrange your note for the best fit on the back of the lamp. Lines will be centered and straight. 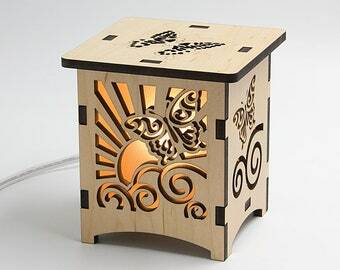 This lamp is laser cut out of 6mm solid wood in your choice of Cherry or Maple. The wood is professionally finished with a clear, protective coat and is smooth to the touch! The designs on the front and sides are backed by a frosted vellum paper to allow for a soft warm glow from the nightlight. Included is a 7.5 watt standard incandescent nightlight with a 6ft cord and on/off wheel switch. The bulb clips in to the bottom of the lamp and is easily removable. NOTE: Due to the nature of wood, each lamp will have a wood grain that is slightly different than the one you see in the picture. This adds a uniqueness to your lamp! Please don't hesitate to message us if you have questions before you buy! SAY HELLO and stay up-to-date on social media! 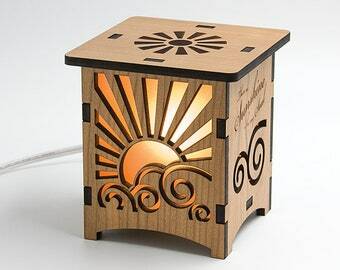 We ordered the Sunburst Lantern for our baby’s room. Loved the design and quotes. Absolutely beautiful and high quality! Seller was easy to to contact about customizations and I received the lamp in a timely manner! I’ve already ordered another lamp for Mother’s Day! My mom loves lighthouses and she immediately put this together on Christmas Day and loved it. Every time I visit she has it turned on in the living room for everyone to see. Love this item and will be ordering again. 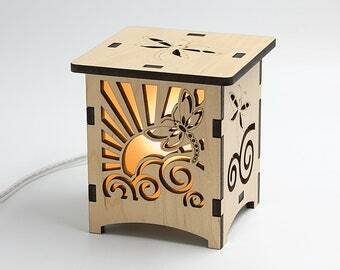 For our wood lanterns and charms, dust as needed. Wipe with a slightly damp cloth to clean. Do not rub engraved areas too harshly as they may scratch. We currently do not take returns unless your item arrives damaged. Please send us a message with a picture showing damage and we will be happy to offer you a refund or exchange once the damaged item has been shipped back to us. Shipping for refunds & exchanges is the responsibility of the customer, not Four Crows Creative. Please contact us regarding any custom order requests. We are happy to discuss anything you have in mind!